Movin’ to the country, gonna eat me a lot of peaches! 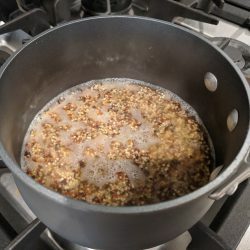 This recipe has me singing and dancing! 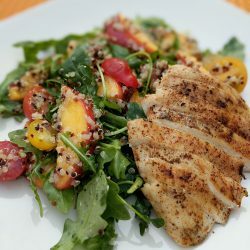 This Peach and Quinoa salad with grilled chicken is delicious! It is the perfect summertime recipe and I literally cannot wait to eat my lunch today! I got this recipe from Cooking Light (click here for the recipe!) I didn’t really make any changes except that I used Quinoa instead of Bulgar (only because I already had quinoa on hand) and I also added creole and blackening seasoning to my chicken before grilling. 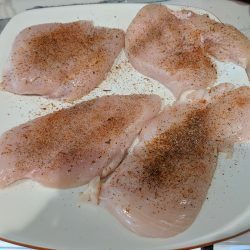 I grilled the chicken on the actual grill (click here for the one I have) or you can use a grill pan (click here for my favorite). These stats are based on a 4oz serving of chicken. This recipe has 364 calories, 14g fat, 30g carbs and 31g protein! 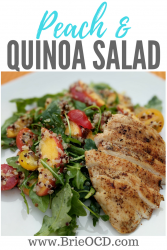 If you are vegetarian just make the salad without the grilled chicken and maybe add more quinoa to give you that extra boost of protein. Gluten-free folks, you are good to go as is! 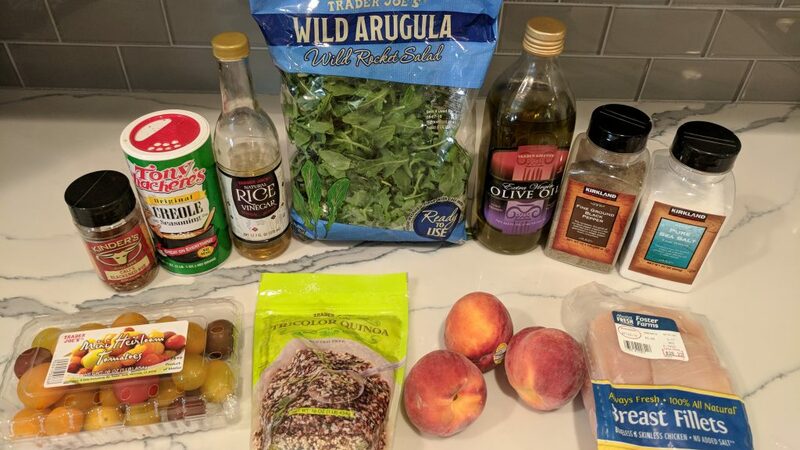 Honestly the salad portion of this recipe is so light and delicious, you could serve the salad as a side to your favorite main or make it in one big batch for a cookout! I hope you enjoy this recipe as much as I did! Its the perfect summer, lunchtime meal! 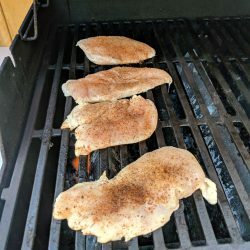 grill chicken breasts for approx 14 min or until reach internal temp of 165 degrees. 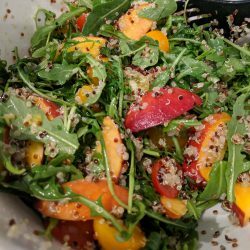 in a lg mixing bowl combine 4 cups arugula, 2 cups cherry tomato halves, 2 cups sliced peaches, quinoa, 1/2 tsp salt, 3 tbsp olive oil, 2 tbsp rice vinegar. toss. 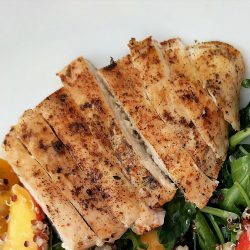 serve salad with sliced grilled chicken! Enjoy!